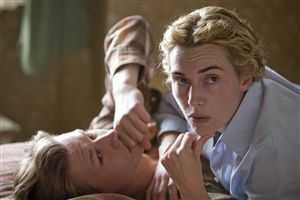 Cast: Kate Winslet, David Kross, Ralph Fiennes. Story: A post-WW2 Berlin 30-something shags a 15 year old boy. Set in Germany but all dialogue is in English. It's the first of Kate Winslet's award-attracting performances - and it's a tricky one to pitch. Kate Winslet is normally cute and cuddly - but not here. As an austere German bus conductor, she cuts a severe figure - if I tell you that the name Helga would suit her character, you'll catch my drift. When a 15 year old passenger chunders outside her house, she starts a fling with him (what a romantic story) and they build a Last-Tango type relationship consisting of alternate sessions of bonking and him reading books to her. Everything goes smoothly, they have a wonderful time together and go on to live happily ever after. No, not really. While the chronologically disparate love-birds enjoy their 1950s fling, our Kate spends about half of the first hour of the movie buck naked, or at least it seems that way. The intervening moments can appear a little flat - the director Stephen Daldry (Billy Elliot, The Hours) can certainly make a little story go a long way. Then, at the half-way point, something crucial happens and everything changes. If you're already familiar with The Reader, you'll already know what that something is, but if you're not, you'd be better off not knowing, because it comes as a welcome surprise. From there on, it's not a romance any more but a cogitator, one to think about and to put yourself in the characters' shoes. As a thinkie, then, it scores pretty highly, but as a piece of entertainment I'm not sure I can recommend it. I found myself dozing off in the first half, woken up every few minutes by the reappearance of the Winslet Watermelons, and while the second half was interesting, it lacked any real emotional involvement - I wasn't particularly bothered what happened in the end. I suspect the critical acclaim has been affected by its two producers - Anthony Minghella and Sydney Pollack - both dying last year. The Heath Ledger effect strikes again. The Reader is an interesting movie. It's very well acted and has an original plot (gasp!) but it's hard for me to recommend that you go and see it. It's like a Ford Mondeo - you can recognise that it's a very good car, but you don't want to buy one. Testosterone Satisfaction Rating: 4/5 Kate flaunts her bits plenty of times, but you'll have to put up with the kid's privates too. No action - it's all dialogue. To enjoy this film: it'll help if you don't know the plot in advance. The Reader was released in the UK on 2nd January 2009.